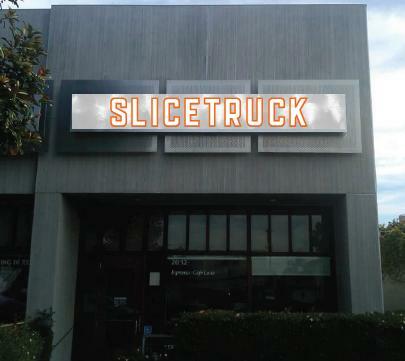 Slicetruck: Merry Christmas and you're welcome! Merry Christmas and you're welcome! As a Christmas present to Los Angeles, we're opening a takeout and delivery place in West L.A. sometime between Feb 1 and March 1 2012. Next we're going to produce a buddy cop movie starring Michael Buble and Tim Tebow. If you don't know me, you don't know that I tivo the Letterman program and never watch them and it takes up all my space on the recorder. But I caught up on a bunch of them and was watching Eddie Murphy on it and I think he needs to start playing a rich guy in movies from now on. Like rich and comfortable in them not rich and cool. Not like Boomerang. Like the way Adam Sandler is always a rich guy in his movies. Like a rich guy with a family. Maybe a movie called "The McDowell's" where he plays the dad. A prequel of sorts to Coming to America. I think this would do well. I could write this quickly and well'ly. I'd just need to know it would be made. They played party all the time when he walked out and I can't get the song out of my mind now for some reason so I pulled it up and the video is just completely unbelievable.